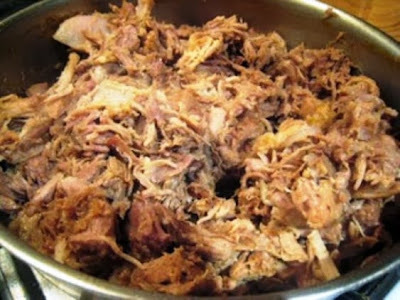 Pork Carnitas are basically Mexican flavored pulled pork. Could be served as a dish by itself or used as an ingredient in tamales, tacos or burritos. This is an easy restaurant copycat recipe for Chipotle Mexican Grill's Pork Carnitas. Salt and pepper the pork and allow the meat to come to room temperature. Add olive oil to a large oven proof pan. Sear the pork over medium high heat to brown on all sides. Remove pork from the pan and let rest for 10-15 minutes. Add onions and cook over low heat until translucent. Return pork to the pan and add the remaining ingredients. Cook for 2-3 hours until the internal temperature reaches 140-150°F. Let pork roast rest for 10-15 minutes before slicing.